We're the helpers. The de-complicators. The figure-outers and the can-doers. 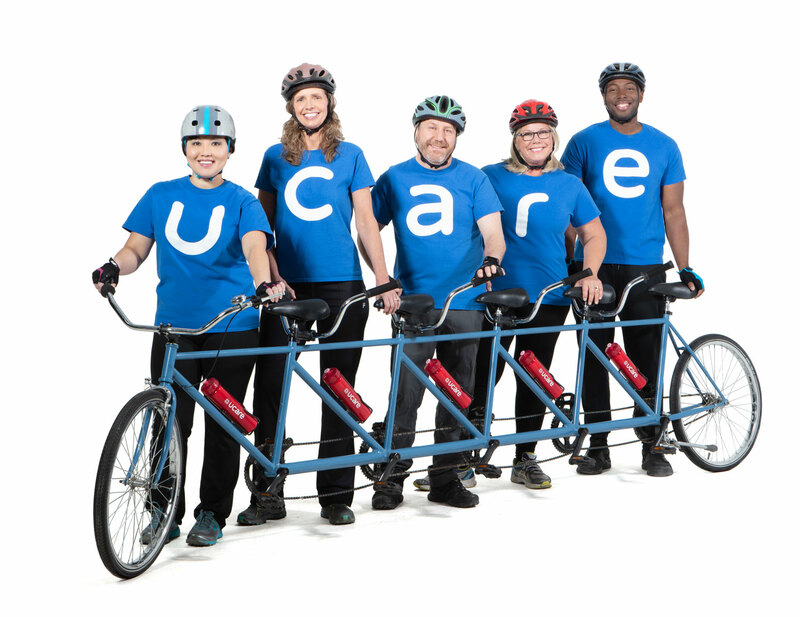 We are UCare, a non-profit, Minnesota based group of go-getters working harder to improve the health of our members. Look at your Medicare options side by side and find the plan that fits your life. Find a Medicare plan that fits your life. Talk with a Medicare expert at a local meetup and get your questions answered. Notice: Due to the inclement weather, we are experiencing a large volume of calls and higher than normal wait times. If your call is not urgent, we ask that you call back at a later time. We apologize for any inconvenience. Login to the Member portal to view claims, change clinics, and see personal information about your plan. Look for a provider or facility. Information for our health care providers and partners. Our team has been out helping people all across Minnesota with their health coverage questions. Person to person. Face to face. And we have the sore legs (among other things) to prove it. Meet the team with the unquenchable drive to get you the right Medicare, Medicaid, Individual & Family health plans. Make sure your kids ride safe this summer by getting a free helmet fitting or replacement helmet. We’re giving out bike bells too … ring, ring! We’re improving lives for members by connecting them to food, housing, dentists, behavioral services and opioid treatment programs. Members can save up to $200 a month on lean meats, whole grains, fresh fruits, vegetables, yogurt and more, at participating grocers. New year, new health plan! Welcome UCare members. Make the most of your 2019 health plan these five easy ways. UCare is nine-time winner of the Star Tribune Top 150 Workplaces. That’s people power! Medicare inquirers. Mall walkers. Coffee lovers. Chat with us in the Mall of America rotunda from 7:30 am – 1:00 pm. Get the answers you need to feel confident about your Medicare choice for 2019. Plus, enjoy a hot cup of Caribou Coffee and a giveaway. Get your steps in at this year’s MN State Fair UCare Stretch & Stroll! Thursday, August 30 in Dan Patch Park. UCare and the U of M Dental School are spreading smiles for miles across Minnesota. Watch how we do it. Opioid overdoses are on the rise. We’re taking action to combat the crisis. Protect you and your family with a flu shot today, and learn flu facts from UCare’s Dr. Amy Burt. Ready to enroll in a UCare Medicare plan? Join us at an Enrollment Fair. Our licensed Medicare sales specialists will be on hand to walk you through the enrollment process. Enrollment is now open for Individual and Family plans! Learn the basics, compare plans and get ready to enroll on MNsure.org. Give UCare’s NEW attraction at Mall of America a whirl. It’s the Skate the Star ice rink! Skating is free; $5 skate rentals donated to the Boys & Girls Clubs of the Twin Cities. We’re making winter fun for Mall visitors.